Email Notes are standard functionality in ECC (Vendor/Customer). All the Notes/Remarks against email will get saved in the ADRT Table. However, this feature is not available in the MDG (till v9.0). As many of the current organization still uses the Notes/Remarks, so it kind of important to have this feature available in MDG UIs. Let’s take an example of ERP Vendor Screen on MDG. 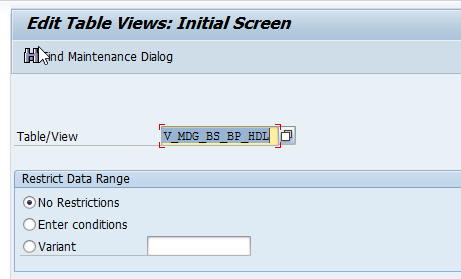 Below Screen overview will give you comparison of MDG screen with Current & Expected Screen after the solution. The below solution is done for Notes/Remarks field only for Email Segment. As we all know Telephone and Fax can also have their own Remarks field. The same solution can be extended to make it available for Telephone & Fax respectively. Solution is divided into 6 steps. follow them carefully. Step 1) Standard Structure which can carry the Notes Data & hold it during the CR preparation. This structure is used in the Handler Class to transfer the Data. Good think about this development, that back-end structures already contains the REMARKS Table which can hold the Notes provided in the E-mail section. We are going to re-use those structures. Field representation is given in the below structures. Have a look at that. In structure MDG_BS_BP_TT_ECC_EXTERN identify the relevant substructure. 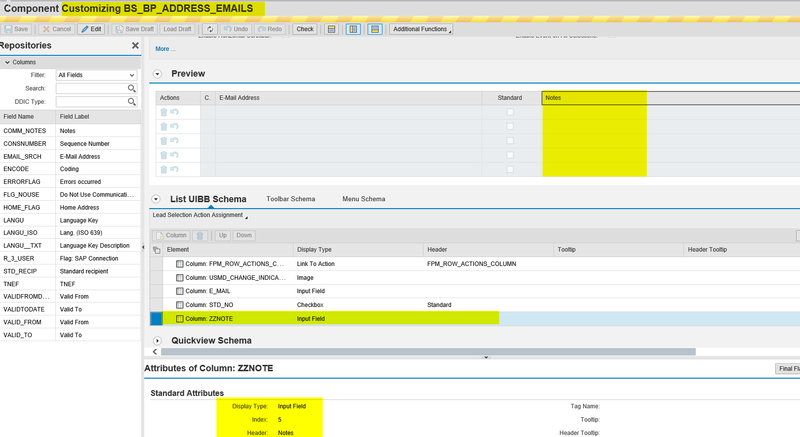 We are going to use the highlighted field to store the Notes in the API. Step 2) Active(Reuse) Area for Notes. For this Development, we are going to use ADRT table as active area for Notes. Just have a look at the table/field which will be used. 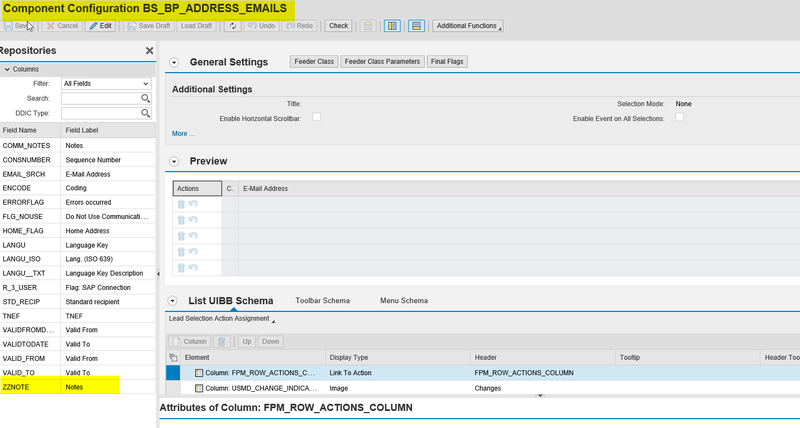 Step 3) Extend the MDG-S/C data model with new attribute “Notes” under Email Entity. While change requests are in process, the data is stored in the MDG staging area. Therefore, you must extend the BP data model accordingly. The necessary steps are outlined in this section. As we are enhancing the standard entity, We just need to create one custom attribute and generate the structures. Add Custom Attribute under AD_EMAIL entity. 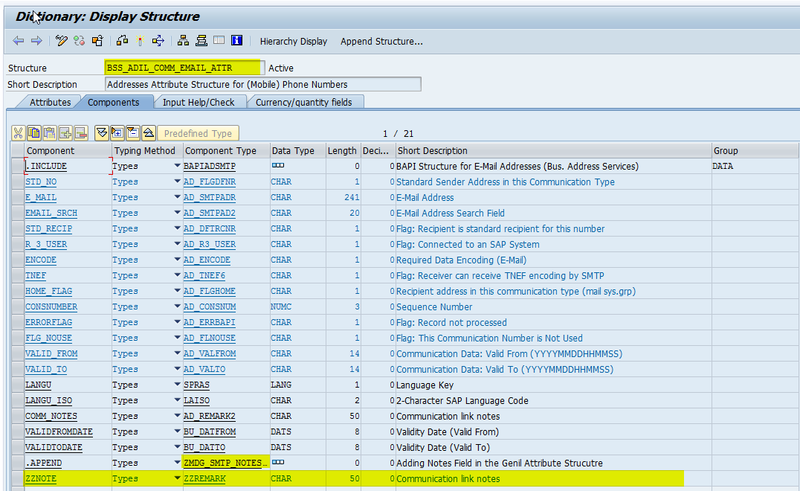 (The Structure BSS_ADIL_COMM_EMAIL_ATTR is enhanced in Step 4. Just Activate the data model with blank reference & later after Step 4, come back again & put the reference structure & activate it again). To Check the Staging Area: Use SE38. Double Click the Attribute Structure. NOTE: If you remember this Genil Structure is used in the data model against that custom attribute ZZNOTE used for highlighting changes. You have extended MDG-S to handle a new field ZZNOTE. Till this step, you can do all the functionality, add a new row, delete a row or change a row (with Notes) and save the CR. All the data is saved in the Staging Tables. You can open the CR and check the data again in the list. Everything is working fine. Except this solution is only half complete. When the CR is approved, the data would be removed from the Staging Area and because no SMT Mapping is available, so data will not move into active area (ADRT). The Next Step (6) is the rest of the solution. It will move the staging data to the active area (ADRT), and bring the active area data to the UI. Implement the Custom Handler to do the SMT Mapping. Redefine all the below method of the class. lt_adrt   TYPE TABLE OF adrt. READ TABLE it_idlist ASSIGNING FIELD-SYMBOL(<ls_idlist>) INDEX 1. 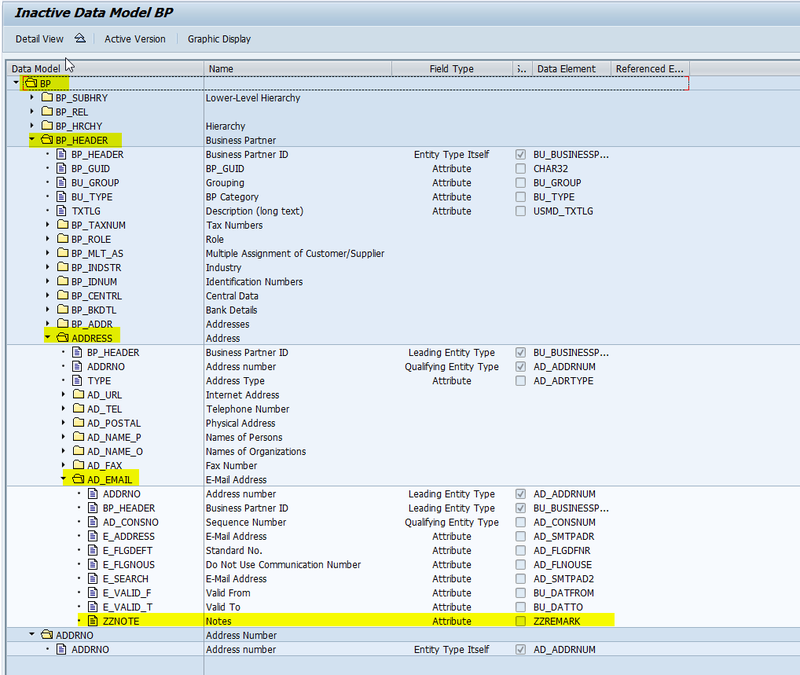 READ TABLE <ls_data>-partner-central_data-address-addresses ASSIGNING FIELD-SYMBOL(<fs_address>) INDEX 1. IF <fs_address>-data-communication-smtp-smtp IS NOT INITIAL. "Fetch the ADRT data only for the 1st Time. "ADRT Data should be fetched based on the ADRNR & CONSNO. LOOP AT lt_return INTO DATA(ls_reutrn) WHERE type EQ 'E'. IF sy-subrc EQ 0 AND lt_adrt IS NOT INITIAL. LOOP AT <fs_address>-data-communication-smtp-smtp ASSIGNING FIELD-SYMBOL(<fs_smtp>). READ TABLE lt_adrt INTO DATA(ls_adrt) WITH KEY consnumber = <fs_smtp>-contact-data-consnumber. READ TABLE <fs_smtp>-REMARK-remarks ASSIGNING FIELD-SYMBOL(<fs_remark>) INDEX 1. GET REFERENCE OF <ls_data> INTO er_data. ASSIGN COMPONENT 'PARTNER' OF STRUCTURE is_data TO <fs_partner>. READ TABLE <fs_partner>-central_data-address-addresses ASSIGNING <fs_address> INDEX 1. CREATE DATA lo_data LIKE LINE OF ct_data.
" Read the Data from IS_DATA and push them in CT_DATA. LOOP AT ct_data ASSIGNING FIELD-SYMBOL(<fs_data>). 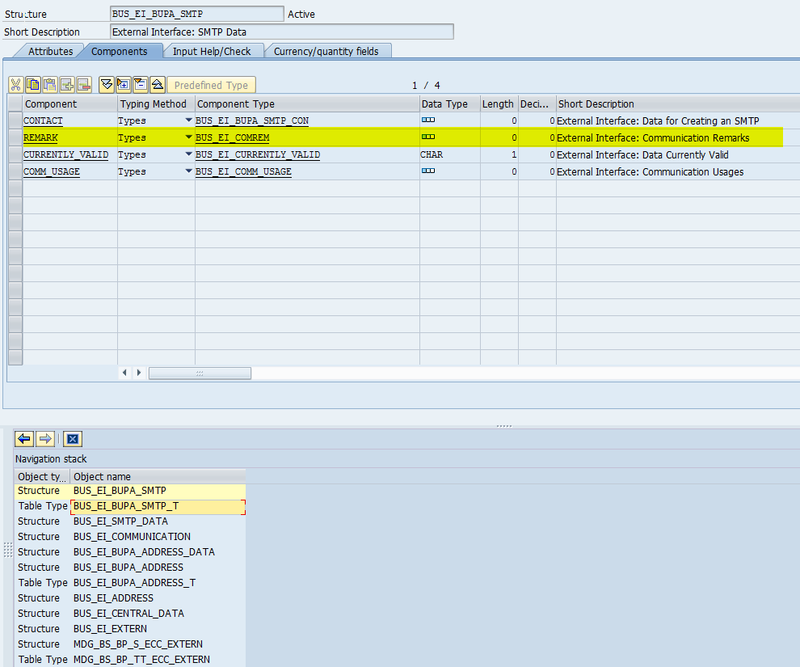 ASSIGN COMPONENT 'BP_HEADER' OF STRUCTURE <fs_data> TO FIELD-SYMBOL(<fs_bp>). IF <fs_bp> IS NOT INITIAL. 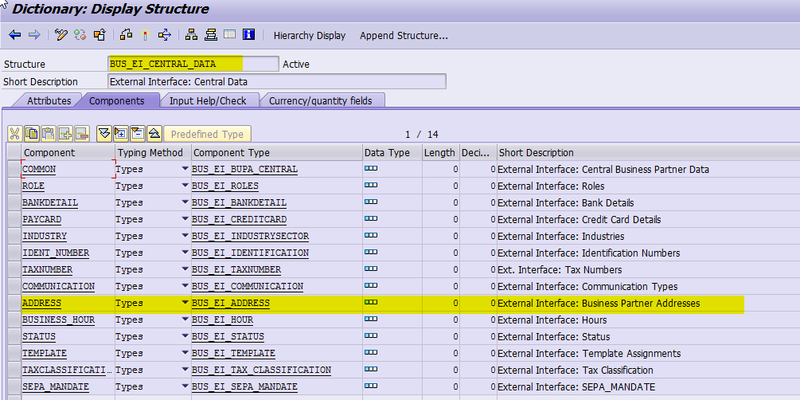 ASSIGN COMPONENT 'AD_CONSNO' OF STRUCTURE <fs_data> TO FIELD-SYMBOL(<fs_consno>). CHECK <fs_consno> IS ASSIGNED AND <fs_consno> IS NOT INITIAL. READ TABLE <fs_address>-data-communication-smtp-smtp INTO ls_smtp WITH KEY contact-data-consnumber = <fs_consno>. ASSIGN COMPONENT 'ZZNOTE' OF STRUCTURE <fs_data> TO FIELD-SYMBOL(<fs_zznote>). READ TABLE ls_smtp-remark-remarks ASSIGNING <fs_remark> WITH KEY data-langu = sy-langu. IF sy-subrc = 0 AND <fs_remark> IS ASSIGNED. 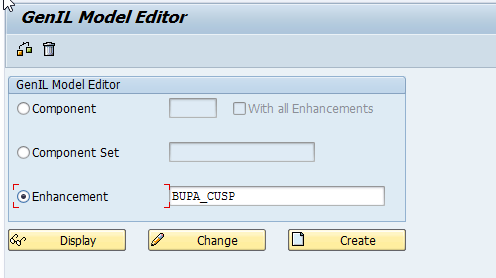 ASSIGN COMPONENT 'PARTNER' OF STRUCTURE cs_data_ext TO <fs_partner> . 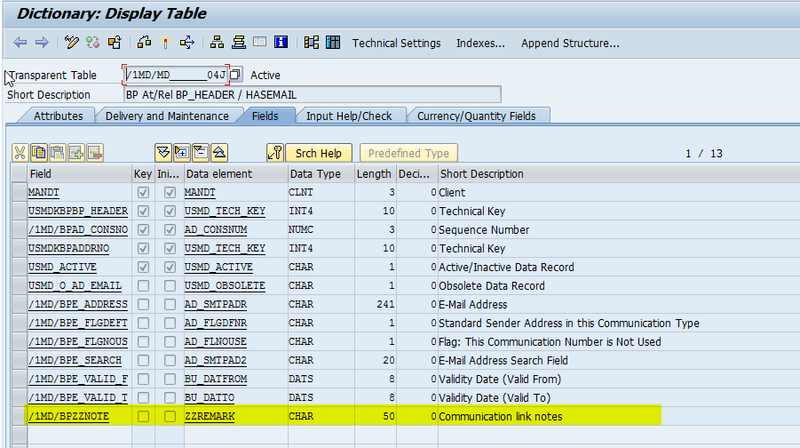 READ TABLE <fs_partner>-central_data-address-addresses ASSIGNING FIELD-SYMBOL(<fs_address>) INDEX 1. ASSIGN COMPONENT 'AD_CONSNO' OF STRUCTURE is_data TO <fv_consno>. CHECK <fv_consno> IS ASSIGNED AND <fv_consno> IS NOT INITIAL. ASSIGN COMPONENT 'ZZNOTE' OF STRUCTURE is_data TO FIELD-SYMBOL(<fv_note>). CHECK <fv_note> IS ASSIGNED AND <fv_note> IS NOT INITIAL.
" Read the SMTP line based on the CONSNO. WITH KEY contact-data-consnumber = <fv_consno>. This above solution is working for Email remarks, similarly telephone/fax entity can be enhanced with another custom field and using SMT mapping in custom handler, remarks can be populated against each field. Thanks for detailed explanation step by step! I have similar requirement for ‘REMARK’ Address Notes Field in ADRCT Table. Therefore, wanted to know which Entity shall I enhance with custom field? Go through the solution once. Understand each steps and you will understand that it is not only Entity but you need to check for the available back-end structures used in API. Corresponding Genil structure which you can use to map the field on the UI itself. To answer your question ‘BP_ADDR‘ is the entity which should be enhanced in order to accommodate the custom Remark attribute but then if you won’t understand the above solution, probably you will be finding it to difficult to map it to the relevant back-end structures in your custom handler. Thanks a lot for the detailed step by step document. Need your valuable help in this regard to resolve above issue. Also please let us know if you faced similar issue after Registering the Handler Class to the BP Data Model. Thanks for correcting the syntax error. Yeah I used 2 systems and during copy code, got the wrong system code. As for the Exception during the Registering of Handler Class, it’s our custom code which sometimes can cause the Exception to appear. I didn’t face any exceptions during my POC, but yeah faced several exceptions (this type) during other custom entities. All I can say you need to debug the standard code. Issue is definitely coming from the Handler Class. Try by removing blank implementation of “IF_USMD_PP_BLOCKLIST~GET_BLOCKLIST_FOR_READ” & “IF_USMD_PP_BLOCKLIST~GET_BLOCKLIST_FOR_WRITE” methods. I implemented these methods because there was exception coming for my other entity & when I implemented these then exception goes away. Make sure you are using Super Class as “CL_MDG_BS_BP_HANDLER” and not “CL_MDG_BS_ECC_HANDLER”. Only Debugging can help here as in my system this solution is working fine. I implemented the same for ‘REMARK’ Address Notes Field in ADRCT Table and its working correctly. Facing one issue – During BP creation process if Remark is empty during BP creation process then if I try to maintain Remark Value during BP change process then its getting cleared during change process. 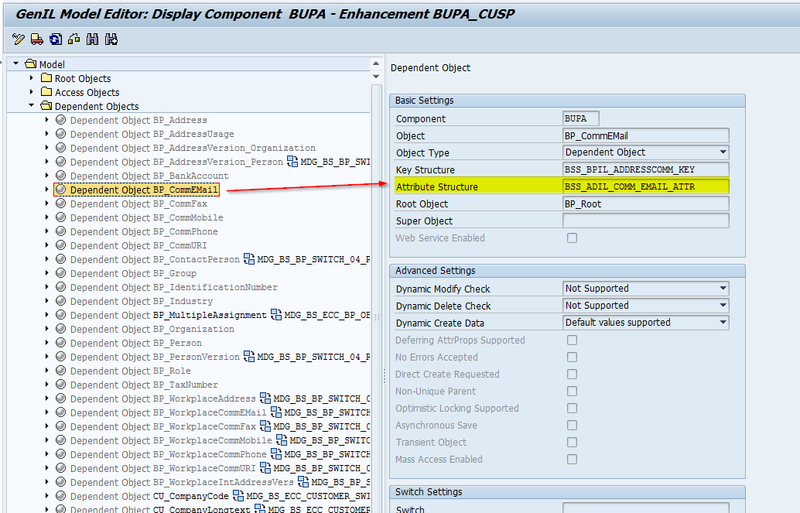 if Remark is maintained with some value during BP creation process then if I try to change Remark Value during BP change process then its working fine. To summarize the issue it is getting cleared during BP change process if I do not maintain any value during BP create process. Please debug the handler class & put a breakpoint in the SAVE method when Approving the CR. The solution is working fine for both, create & change and for EMAIL ID, TELEPHONE, FAX everywhere. In your case, you are doing it for address. there must be something in there which is missing like IV_TASK value. Try to use entity AD_POSTL in place of BP_ADDR, working fine for me. This solution doesn’t work when there are multiple addresses in address uibb. For example if i have 2 addresses under undress uibb and i have multiple E-Mail Addresses under each Address this doesn’t work. When i change one email notes it gets reflected to other address also. And deletion of an email address is also not working. The email address comes back. Tried a lot but couldn’t find any solution. Can you please test or let me know if you have faced this issue. Please check this scenario and let me know. Apologies for late reply, this solution is designed considering only 1 Address is available. However if you multiple address, then basically you need to find correct ADRNO for the address and emails linked to it. Then it should work. I can’t test the multiple address scenario, as we are strictly using 1 Address only and just to test multiple address, I need to change a lot in my box. This is a very good post, Congrats!! I need to display infotype BP3100, and already implamented CL_MDG_BS_BP_HANDLER class, I wonder which of the methods are mandatory to display the data I need?